Placid Waters, originally uploaded by A Dubs. 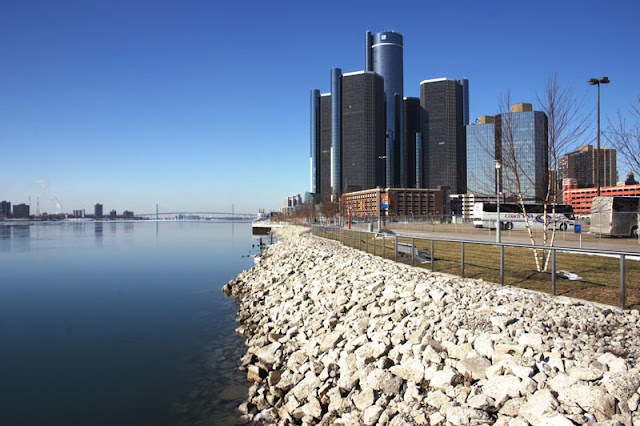 Last year General Motors gave six acres of land just east of the Renaissance Center to the Hines Real Estate in exchange for a cut of the future profits from a development there. They plan on building about 600 luxury condominiums that would sell for roughly $300,000 to $1 million apiece. By late summer or early fall model condos should be available for viewing with the units going on sale shortly afterward. This announcement comes at a time where many previously planned condo/loft developments in the city are struggling with financing, or have failed. The Mid-Med lofts in Midtown are being converted to commercial uses after the units failed to sell. The Griswold luxury condominium project was scrapped. In total, this cost the Detroit Downtown Development Authority close to $1.5 million. 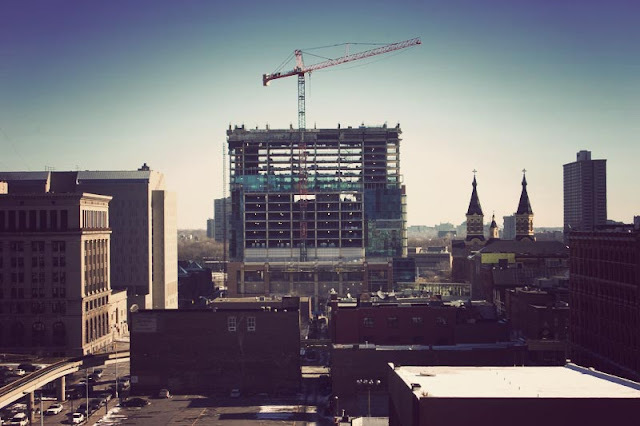 The city and its partner had to pay half the cost for structural steel and precast concrete molds that they had previously ordered for the project as well as paying for the structure to be reinforced in order for the condominiums to be built on top. Two other project in the immediate vicinity of the GM's riverfront development have been delayed and may never come to light. Dave Bing's $60 million Watermark Detroit recently received a nine month extension on its development agreement deadline for providing the Detroit Economic Growth Corp. proof of its financing commitments. Banks are now insisting that more than 60 percent of the 112 residential units be pre-sold before the project continues. The @water lofts (dead link), which was due to break ground last summer is faced with similar funding problems. The developers have been forced to find additional investors after banks increased the required level of pre-sales to more than 60 percent as well. Hines plans to complete the project in phases. Where the money is coming from will be a determining factor in whether or not this project comes to fruition as planned. Something will be built upon these parcels eventually.The question is what and when? Over the years the fortunes of Detroit's oldest neighborhood have mirrored that of the city proper. In many ways the story of Corktown is the story of Detroit. Detroit's Corktown from Arcadia Publishing examines the fabric that has held this neighborhood together through its many ups and downs. The story of Corktown begins in the 1830's when the Cass and Woodbridge families began to sell off their ribbon farms west of downtown for development. This area was quickly filled by the hundreds of Irish immigrants newly arriving in the city. Authors Armando Delicato & Julio Demerly devote the early pages of the book to the cultural and religions institutions that the Irish established in the area. With a few exceptions, Corktown has always been a working class neighborhood and this is reflected in its housing stock. The neighborhood's housing stock has evolved from Shotgun Houses to Greek Revivial and later Gothic Revival gradually becoming more stylish. There are a shortage monumental residences that exist in other neighborhoods. However, Corktown has been one of the most successful neighborhoods in preserving its architectural heritage inspite the coming of freeways and numerous urban renewal projects. The book successfully captures the essence of the community providing numerous photos of area homes. Urban renewal and redevelopment was the prevailing theme in Detroit during the middle part of the last century. Corktown's residential nature proved to be an obstacle to the city's plans. Converting the neighborhood to light industrial was seen as a necessity in order to retain manufacturing synergy with downtown. Two freeways were built cutting through huge swaths of Corktown, dividing it and isolating it from the rest of the city. Other sections were raised to make way for industrial parks, may of which now sit empty. The rise of the automobile precipitated a steep decline in rail travel which ultimatatly lead to the demolition of one of Corktowns train station and the famous abandonment of another. Despite of all of this destruction in the name of progress, Corktown has managed to hang on. Residents fought the destruction of their neighborhood and manage to contain the devastation. Corktown is no longer an ethnic enclave, but it has managed to attract new residents and businesses to begin to fill the void left by the loss of train Stations and Tiger Stadium. Later pages are dedicated to the new pioneers as well as those institution that have held firm, surviving though many decades of turmoil. Detroit's Corktown provides valuable insight into history and character of one of Detroit's most colorful neighborhoods. Considerable space is devoted to historic photographs of the district and its people. The photos are supported by chapter introductions and lengthy, informative captions. As an introduction to one of Detroit's cultural gems, the book serves as a valuable resource. Photos reprinted with permission from Detroit's Corktown, by Armando Delicato & Julio Demerly. Available from the publisher online at www.arcadiapublishing.com or by calling (888) 313-2665. The Gem Theater opened as the Little Theatre in 1928. It was built for the Detroit woman's group "The Twentieth Century Club" as an addition to their Century Club facility which was constructed in 1903. After being opened for just one year, the theater was leased to Motion Picture Guild to show the first foreign films in Detroit. In 1959 the theater became the Vanguard Playhouse and hosted repertory theater. By 1967 the theater returned to being a movie house showing adult films until it closed in 1978. The theater was completely restored and reopened in 1991 to host a series of hit musical and comedic productions. On November 10, 1997 The Century Club and Gem Theater were moved about a half mile from their original location to make way for the construction of Comerica Park. Thus, the theater had to be preserved for a second time. This time, the Century Club was restored as well. Many architectural features from the demolished Downtown YWCA were salvaged to facilitate the building's restoration. Pewabic tile from the pool, stained glass panels from the chapel, leaded glass doors, chandeliers, fireplaces and cornices were all seamlessly incorporated.